Sonlight Curriculum sent me the first MathTacular™ DVD (PreK - 2) to review...well, technically I suppose I should say my kids were the real reviewers. Our oldest three (ages 4, 6, and 7) took great joy in being able to "watch" math lessons. I was able to enjoy the rewards of the time they spent reviewing and learning! Despite my best efforts, there are times when seeing someone else talk about a concept or have it approached in a new way makes all the difference. 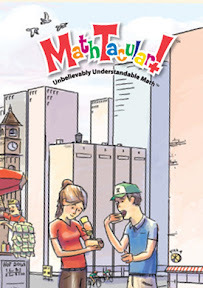 MathTacular™ was created by Sonlight to help explain math concepts from a variety of math curriculums: Singapore, Horizons and Saxon. Justin (who produces and *stars*) shows real-life applications to math concepts: running a track to show the different laps, having a money count-off, or using many other manipulatives to get the ideas across to the kids. Our 4 year old started pointing out 1st, 2nd, 3rd, etc... places to me one day and when I asked him where he had learned it he said, "The Math movie, Mom!" MathTacular™ has helped put a new twist on our math creativity at home too. The kids are noticing math in things around the house which shows that they are applying the skills they are learning!! We've been using it as an add-on to our school time, picking one of the clips (usually under 5 minutes each) to build on a concept that we are talking about or need a little added help on. The DVDs feature over 4 hours of fun 'teaching' time for kids and almost 100 different real-life applications so that kids gain a more hand-on approach to math concepts. Areas covered include skip counting, color sorting, patterns, calendar, measurement, fractions and more. There are also printables in pdf format on the DVD to use as tools along with the DVD. This is the first in a series that Sonlight has available for purchase on their website and also on Amazon . And since I'm a visual person and love to see exactly what is being talked about, here's a little clip to give you an idea of what the video includes. Be sure to visit the Homeschool Crew blog to read reviews of some other Sonlight products! Woo-hoo! Glad your family is enjoying MathTacular. I love hearing when our efforts have been more than worth it [smile]. i want to check it out. looks like fun and nothing better then making school fun. Cool! I was wondering about these videos. I just might pick one up for my children who struggle with math. Thanks!